When a man with as many names as Luke Slater starts a new project, it can be hard to know how to interpret it. Just another in a long string of alter egos? Or a new approach from a producer eager to detach himself from preconceptions? L.B. Dub Corp isn’t a particularly new name (it’s been around since 2007), but the choice to release an album under that name certainly demonstrates some level of ambition for the project — an ambition that one listen through Unknown Origin confirms in multitudes. In anticipation of his appearances at Output for The Bunker on Friday, September 13th and Smart Bar for Oktave on Saturday the 14th, LWE sat down with Slater recently for a quick chat about his new album, techno’s multicultural roots, and getting billed under his birth name. Your L.B. Dub Corp alias has been slowly, steadily ramping up activity over the past seven years, most notably with the 12″ for Ostgut in 2010. Why was now the right time for an L.B. Dub Corp album? 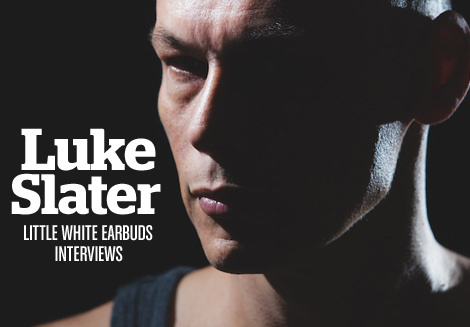 Luke Slater L.B. has always been my new child I’ve had fun developing, as almost a balance weight to P.A.S. — that’s just the way I am. After the 12″ Take It Down (In Dub) and the response it got there was a natural urge to write an album. The decision was easy but the creation was challenging ,not only because we were in the middle of a P.A.S. live tour and probably the longest time I worked on an album. It’s very much a bringing together of hearts, minds, rhythm, and sound. And to get all these working with the right message was tricky but satisfying when mastered. How did you approach Unknown Origin? Was there a driving concept behind it? I am something of a cross pollination of cultures, being a quarter American (on my grandfather’s side), a quarter South Korean (on my grandmother’s side), and 50% British. In my life so far that has led, I think, to some positives and negatives. From what I do in music it’s been a blessing. To somehow not be defined by type and somehow be able to exist in many walks of life has given me some life experience of discovery. There has been negative sides, occasional racism in the UK based on looks, racism in the school days, not always wanting to be not quite British or quite American/Asian neither. I’ve always put my need to create, the drive for it down to the American side, some kind “I will build here” raw vein. So the name of the album, the message in the album, is about this cultural mix, these future intertwined traditions and adopted ways, the creating of new ways based on that blend, celebrating this and at the same time making a point about the problems not celebrating this in the world. The inclusion of dub poet Benjamin Zephaniah and the overall sound of Unknown Origin seems to point towards a particularly UK sense of multiculturalism — a theme that a track like “I Have A Dream” hits on. Do you think techno is a genre that embraces multiculturalism, or do you see it as a sound in need of different, fresh cultural viewpoints? Well I think real techno started as and is a worldwide language. I’ve witnessed over time different levels of engagement in it culturally: on the bad end, being attacked in a provisional Belgium town by a guy from a predominately white, redneck muscle crowd for not playing hard enough; on the good side, great great nights where anyone of any walk seemed to be euphoric in a different kind of dimension. I’ve never seen the music as political and in fact I think this is the first album I’ve written that slightly tackles some political angles with the music. Or maybe cultural angles, I should say. Being a big fan of Benjamin’s work and the way he puts across his messages — and the realization that maybe some worlds could be bought together in this album — felt just right and something I think is important in my musical approach. You’ve mentioned that when making music as L.B. Dub Corp it’s easier for you to pinpoint what it is that you don’t want. What is is that you don’t want in L.B. Dub Corp’s music? I don’t want anything that is there for any other reason than the track or song justifies it. Defining and focus are much more important to me with L.B. Berghain seems to have played a major role in your return to Planetary Assault Systems back in 2007, especially given your strong relationship with Ostgut Ton. Is there a similar kind of club or venue where LB Dub Corp would feel particularly at home? That’s an interesting question. I think Berghain is yes, more P.A.S. orientated. Maybe this is more Panorama bar,or perhaps something new altogether. Your two state-side shows this weekend see you billed simply as Luke Slater, and yet it’s been quite some time since you released music under your birth name. How do you approach gigs like this, where, conceivably, fans of your many different pseudonyms and projects might be showing up, all expecting something slightly different? Yes, that has been quite a challenge over the years of varying degree. It’s a relatively unique situation. Essentially when I’m DJing anywhere I’m not P.A.S. or L.B. Dub, though I might play some of those records. I am how I started. A DJ playing music I like. You’ve been such an active voice in techno for over 20 years — what do you find is the biggest difference for you, personally, between the techno world of the 90s and the techno world of today? Well the 90’s was certainly, as I felt it, a mad, developing, chaotic, fast time where a DJ like myself traveling the world and doing loads of gigs was a phenomenon. The music was suddenly being discovered by the world, a whole new set of people who came after my roots around 87-89 and the music that was there then. I really don’t feel that a DJ traveling round the world these days is big news, but I do think creatively trying things in your art requires dedication,single-mindedness and focus and I think that’s something I couldn’t do in the 90’s. What’s coming up next for you and Mote-Evolver? Just up is the new P.A.S. EP No Exit and we have some great stuff lined up too for next year. Er, like. Went to PAS website to buy LS downloads. It has whirls and twirls but it aint got no delivery button. I’m dizzy. Is there somewhere I can sit down? I just came for music. That’s the raison: the music.